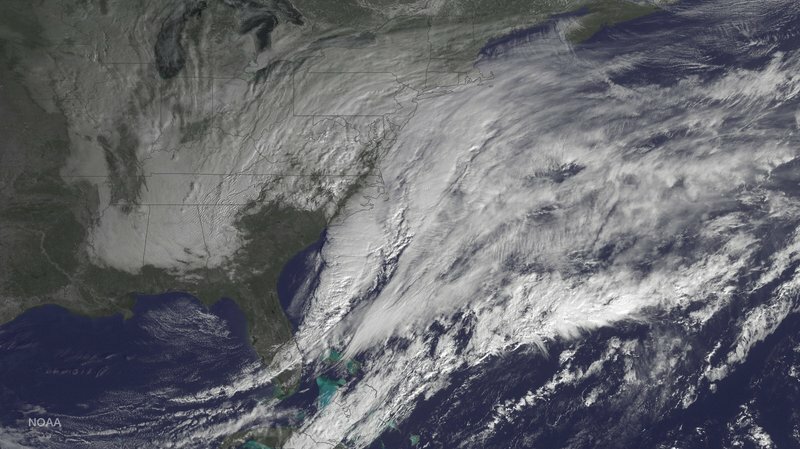 The National Oceanic and Atmospheric Administration posted this photo taken Monday of the storm bearing down on the U.S. Northeast. The National Weather Service says 18-24 inches of snow will fall from late Monday night through early Wednesday. The largest snowstorm of the winter is bearing down on Maine, bringing with it the threat of blizzard conditions and the potential to drop up to 2 feet of snow on Greater Portland and York County from late Monday night through early Wednesday. Forecasters say they are confident the nor’easter won’t change direction, prompting the National Weather Service to issue a blizzard warning late Sunday afternoon – more than 24 hours in advance of the storm – for coastal and central Maine. A major snowstorm was expected to hit the area beginning late Monday evening. Emily Van Cannon picks up a shovel to purchase at Maine Hardware on St. John Street in Portland Monday. Van Cannon, of South Portland, was shopping for group homes in the area. Emily Van Cannon of South Portland filled her cart at Maine Hardware Monday with emergency items in case the power goes out in the approaching storm. The entire northeastern United States is in the storm’s path. A blizzard warning was also issued Sunday for New York and Boston. Mayors in both cities warned residents to stay off roads if possible. Both metropolitan areas could receive as much as 3 feet of snow from the nor’easter. “This could be a storm the likes of which we have never seen before,” New York City Mayor Bill de Blasio said during a news conference Sunday. De Blasio told The Associated Press the storm could land on the city’s top 10 list, which dates back to 1872. The weather service office in Taunton, Massachusetts, made a dire prediction in a bulletin on its website. “A crippling and potentially historic blizzard to impact the area mainly from late Monday into Tuesday and lingering into early Wednesday,” the bulletin said. 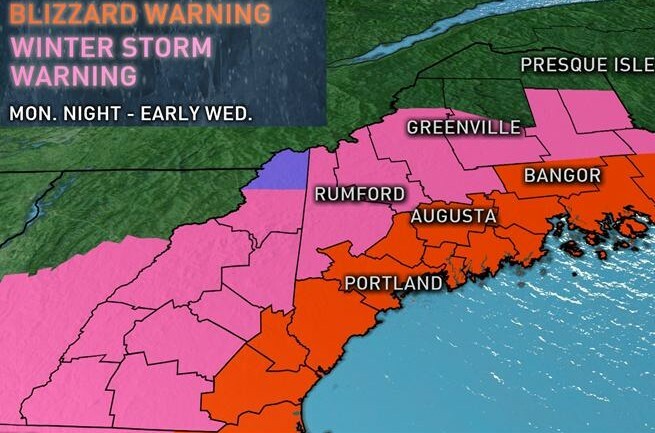 The weather service’s blizzard warning for Maine covers the entire coastline – including Portland, Rockland and Bar Harbor – as well as Lewiston, Augusta and Bangor. The warning covers the period of 10 p.m. Monday through 4 a.m. Wednesday. The weather service predicts that the Portland area and most of York County will receive between 20 and 24 inches of snow by the time the storm ends. 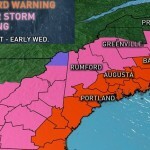 Coastal and inland communities north of Portland, such as Augusta, Bar Harbor and Bangor, will get between 15 and 20 inches. No town in Maine will escape the storm. Millinocket will get 12 to 15 inches, while 8-12 inches are expected in Jackman and Aroostook County. About 1,400 flights scheduled for Monday are expected to be canceled, according to the flight tracking site FlightAware, the AP reported. Inbound and outbound flights scheduled for the Portland International Jetport are typically canceled when airports in major cities such as New York or Boston are shut down because of bad weather. A message posted on the jetport’s website Sunday advises travelers to check with their airlines for cancellations in advance of arriving at the jetport. Several major airlines Sunday had already posted notices letting travelers know that they can cancel or change flights for the storm period only without facing a penalty. Sinsabaugh said the most intense part of the storm will take place between 7 a.m. and 1 p.m. Tuesday. Motorists may encounter blizzard conditions. Because of the strong winds, visibility will be poor. A blizzard is defined by the weather service as the period during a storm when there are sustained winds of 35 mph or frequent gusts of 35 mph, along with heavy or blowing snow with visibility reduced to one-quarter of a mile or less. Whiteout conditions – in which it is difficult to see in front of oneself – must persist over a period of three hours for the snowstorm to qualify as a blizzard. Peter Mills, executive director of the Maine Turnpike Authority, said he will likely confer with officials from the Maine Department of Transportation on Monday to develop a strategy for dealing with the storm and the hazardous conditions it will create for motorists. The only other storm that even comes close to the intensity and size of this one – at least in recent memory – occurred Feb. 8, 2013, Mills said. Mills said he remembers meeting with MDOT officials to discuss whether they should shut down the turnpike and Interstate 95 as reports of Maine State Police cruisers and plow trucks sliding off the highways started to mount. Transportation officials in Massachusetts and Connecticut closed all their major highways during that storm, but Maine officials decided against closure because they wanted emergency vehicles to be able to use those highways. “The storm didn’t close us down, but it came close,” Mills said. Amtrak, which operates the Downeaster train between Brunswick, Portland and Boston, issued a statement Sunday informing customers that it is preparing for “the potential of a highly disruptive winter storm.” Trains should run on a normal schedule Monday, but Amtrak warned that there could be service interruptions Tuesday. The soft texture of the snow is good news for electric utilities such as Central Maine Power Co., which start to make emergency preparations and often call in crews from Canada or other states when forecasts call for wet, heavy snow. Despite the prediction of “fluffy” snow, Carroll said CMP will be closely monitoring the storm. Nearly 30 million people in the Northeast are bracing for what the National Weather Service is calling a potentially historic blizzard that could bring more than 2 feet of snow today and Tuesday to parts of the region. Blizzard warnings have been issued all the way from the New Jersey shore to coastal New England from this afternoon through late Tuesday. The National Weather Service said New York could get as much as 2 feet of snow; Boston and Providence, R.I., could get up to 2.5 feet. Wind gusts of up to 50 mph are expected inland, and some gusts could reach 75 mph on the Northeastern coast. In New York, Gov. Andrew Cuomo declared a state of emergency for Bronx, Dutchess, Kings, Nassau, New York, Orange, Putnam, Queens, Richmond, Rockland, Suffolk, Ulster and Westchester counties. Nonessential state workers in those counties are being asked to leave at 3 p.m. New York City’s subway service will operate on a limited schedule after 7 p.m., he said. “This is going to be a serious blizzard that should not be taken lightly,” Cuomo said. In Connecticut, Gov. Dannel Malloy, besides declaring a state of emergency, announced a travel ban for all roads starting at 9 p.m. tonight. New Jersey Gov. Chris Christie declared a state of emergency for the state and authorized a staggered dismissal at 1 p.m. for state officers and nonessential workers. He said state offices will also be closed Tuesday. In Boston, Logan Airport officials said no flights will leave the airport after 7:30 p.m. There will be no air traffic at the airport on Tuesday. 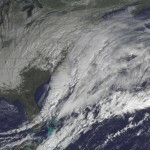 “This could be a storm the likes of which we have never seen before,” New York City Mayor Bill de Blasio said Sunday. De Blasio said today that all nonemergency traffic will need to be off the road after 11 p.m. The nor’easter could cripple travel. Already, thousands of flights have been canceled or delayed. Daniel Baker, CEO of the aviation tracking site FlightAware.com says this could be a good chance for stranded airline customers. “The good news is that every airline is offering fee-free changes, and in some cases cancellations and rescheduling opportunities,” he says.